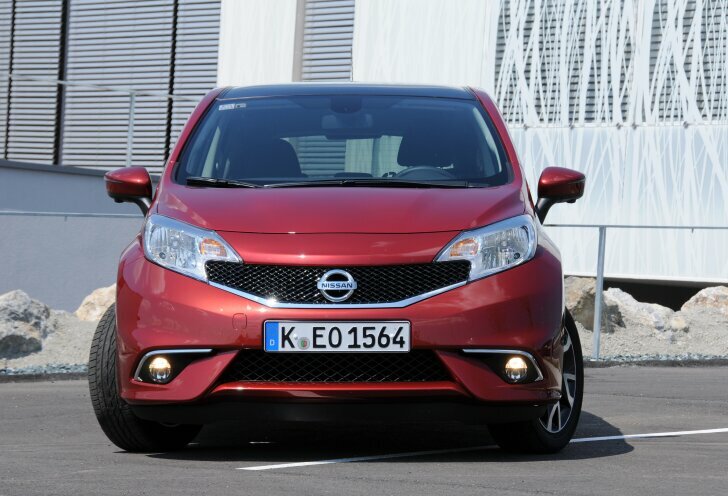 Review | The first generation Nissan Note was a fine MPV that looked decent and drove well. But... Nissan wanted more than that! With exceptional looks, smart technology and sublime handling the new Note aims to be the best in its class. 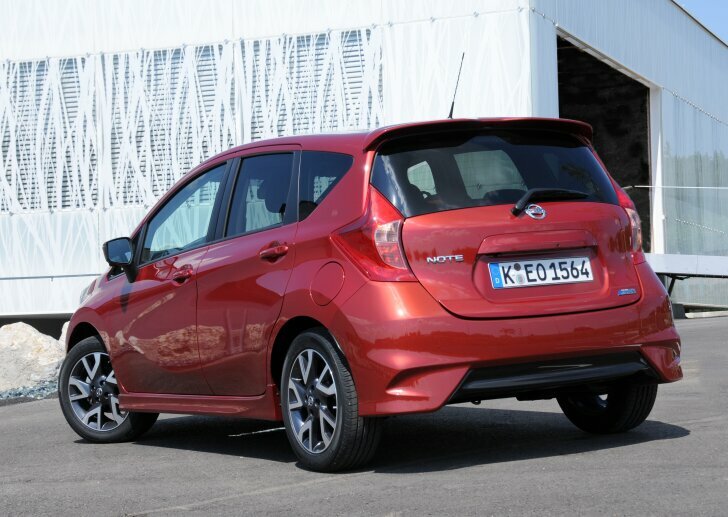 Even more: Nissan wants the spacious Note to compete with traditional cars. Is the new Nissan really that Note-worthy? First, the difference between a regular car and an MPV. A "Multi Purpose Vehicle" is tall, boxy and therefore more spacious than a regular car. This also makes it a less aerodynamic and therefore less sporty car. 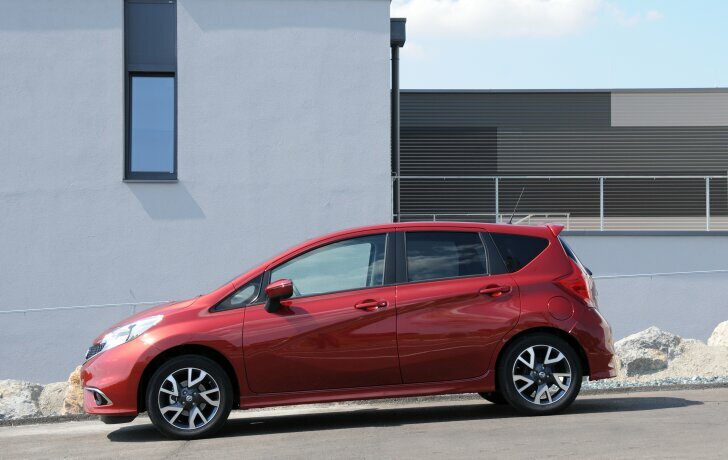 Just like the first Nissan Note, this second generation is a tall, roomy people mover. The sleek new lines manage to disguise this well. The front features a huge grille which seems to have taken a bite out of the headlights, which gives the Note a unique personality. 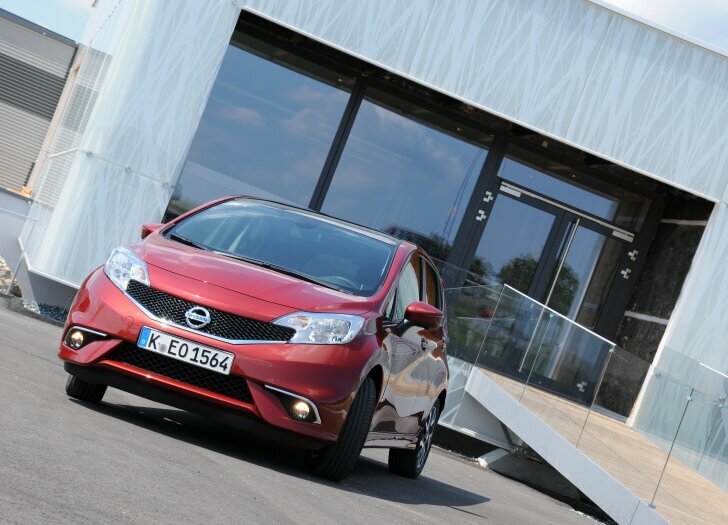 The test car is fitted with the optional "Dynamics Package", which adds a welcome sporty look. The cabin is something in between an MPV and a normal car as well. Some of the details have been copied from Nissan's fun car: the Juke! The headroom, legroom and room to move around the front seats is good. The back seat is mounted on rails, so depending on the situation one can opt for more legroom or more storage. With the back seat slid all the way to the back, even tall adults fit comfortably in the back. Because the rear seat is raised just a little, the view to the front is less obstructed. 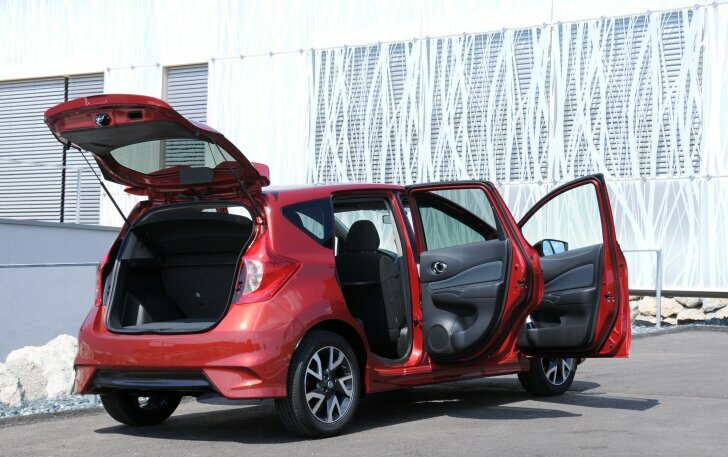 Also very smart: the doors open at an angle of almost 90 degrees, making getting in and out of the car very easy. The number of storage spaces is a bit disappointing for a car like this. There are two separate glove boxes, but other than that the Note doesn't feature any space savers or ergonomic gadgets. Instead, Nissan goes for modern technology. This starts with "Nissan Connect": a combined audio, satnav and communication system that is available on many models. It functions very well, also when connected to an iPhone or iPod. The Note is the first Nissan that can be fitted with a "Safety Shield". This combines three systems: blind spot detection (warning light in the mirror that alerts for vehicles in the blind spot), lane detection (warning when crossing the markings on the road without indicating) and a reversing camera that also actively warns for moving objects around the vehicle. The Note is available with two petrol engines and one diesel. Both petrol engines have three cylinders and a displacement of 1.2 litres. The difference is in the presence or lack of a compressor. The so-called "DIG-S" allows for huge internal losses to preserve energy, but still performs well (98 PS / 147 Nm) thanks to a compressor. Driving this special engine does require some getting used to. When shifting up too early, the speed can drop and/or acceleration is dead slow. Only when the engine speed is kept above 2,000 rpm is performance adequate. Still, the "Note 1.2 DIG-S" is never quick or exciting. A big light just above the speedometer is either dimmed (bad driving) or green (efficient driving) to encourage the driver to save the planet. Nissan states that 65 mpg is possible, but that's too optimistic. Even when trying to drive as efficiently as possible, 51 mpg is the best possible figure. This still makes the Note more frugal than most of its rivals. Nissan doesn't just present the Note as an MPV, but also as a possible company car. So, there's a diesel engine on offer! While the DIG-S petrol engine is exceptionally quiet, the diesel engine is downright noisy. On the other hand: it does perform much better than the petrol-powered version. This automatically gives a more mature and "grand" feeling to the car. With the diesel engine the Note isn't just frugal in theory, it is efficient in real life as well. 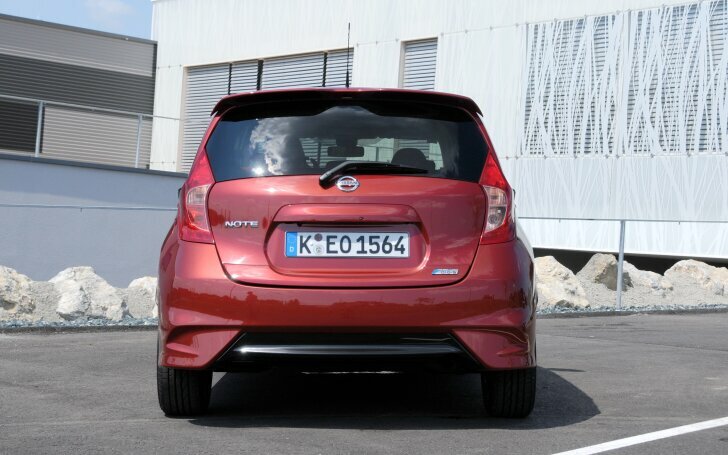 According to Nissan the 90 PS / 200 Nm strong diesel engine covers 79 mpg. When calmly going with the flow of traffic 76 mpg can easily be achieved. The most important strong point has been kept to the very end: handling. Because an MPV is heavy and tall by nature, it never handles as well as a low and compact car. The Note is tall as well, but thanks to the use of modern materials the new Note weighs about 55 kg less than its predecessor. Thanks to the low weight the Note doesn't tilt as much in fast corners and reacts more gracefully during an emergency stop. The suspension matches the character of the car very well. In combination with the diesel engine, steering gives lots of feedback. When opting for the petrol engine, steering is exceptionally good. The lighter petrol engine makes for a more precise feeling in the steering and a faster response to the driver's input. This makes the car feel smaller, lighter and more dynamic than it actually is. Nissan boasts about the new Note! This compact MPV doesn't just want to be the best in its class, but even wants to compete with regular cars as well. A lengthy test drive proves that Nissan succeeded in its plans. Compared to other MPVs, the Note looks modern and more sporty. The engines are above average as well, but when it comes to a combination of performance and efficiency the Note isn't the best in its class. The Note offers lots of cabin space, yet lacks the gadgets to utilise this. The equipment levels and handling (with a petrol engine) are sublime. That is why the Note can indeed compete with traditional cars. Of course the Note offers more space, but the price is equal.